American artillery fire control and doctrine made it among the most flexible in the war. One major difference between U.S. artillery and that of other nations is found in the Call-for-Fire table, which shows that U.S. troop units are capable of calling General Support artillery. In Closing with the Enemy, Michael C. Doubler says: "Artillery FOs with infantry battalions often became casualties or were not in a good location to call for fires. To solve these problems, infantry regiments in Sicily and Italy began to train all personnel, down to and including platoon sergeants, in FO procedures. At the same time, artillery units began to train all members of FO teams in call for fire techniques. By having more people qualified as FOs in the front lines, infantry regiments helped ensure the availability of constant, responsive fire support." In Battlefront, every U.S. troop unit a potential spotter. Most other nations followed the doctrine developed in World War I, where only the trained observers and officers were expected to control fire missions. The Americans independently developed the "map reference" technique developed by the British, but went a step further by developing precomputed visual and mechanical aids that automated most of the calculations needed to conduct fire missions. This allowed them to bring down fire with the speed of the British (about 3 minutes from request to firing) and the precision of the Germans. One of the factors computed by these aids was the time-of-flight of the shells. By timing when the batteries fired, the U.S. fire direction centers were able to have the fire from all of the assets in a mission arrive at the same time in a single deadly strike known as a "Time-on-Target" mission. It should be noted that all nations were able to do these computations, but the American advantage was that they were pre-computed. This allowed the U.S. artillery to use the computations without having to actually do the computations, greatly speeding the task. For a true (and extremely readable) account of American artillery in action, we would like to recommend Robert Weiss's excellent book "Enemy, North, South, East, West". He and another U.S. FO, their radios, and massive artillery support kept elements of two German S.S. Divisions from mounting an effective attack on a single surrounded U.S. infantry battalion for almost 5 days during the Mortain counterattack in early August 1944. Command - High level/Diffused. The U.S. was able to allocate artillery as needed, even from different organizations. Control - Lowest level. Although Battalion Fire Direction Centers (FDC) made the actual decision on which missions to fire, and trained Forward Observers were the favored artillery spotters, the ability to request missions was given to most front-line troops. If the FO becomes a casualty, the ability to contact the artillery is not lost. Communications - Excellent. Almost everyone had a radio and ground lines were also used when available. This allowed calls-for-fire not only to be easily placed, but also heard and possibly responded to by anyone on the "net". The key to U.S. artillery is its flexibility. U.S. batteries of direct support battalions can fire independent missions without penalty (other than that every mission will require a separate spotter). Unlike the Germans, they will be able to recombine into battalion fire later. According to David Weseley, the Battalion FDC was capable of directing two separate fire missions at a time. Also, with an historical response time of about 3 minutes from call-for-fire to fire mission, it would not be unreasonable to allow all 3 batteries of a DS battalion to fire independent missions in the 10 minute period that the Battlefront turn represents. Note that calling for fire from higher level organizations (divisional, corps, etc.) added about 3 minutes to the response time for each additional level. A reasonable restriction would be to allow 3 separate fire missions from a DS battalion if no general support artillery was added, but allow only 2 separate missions if one of them calls for general support, and allow only one of the missions from the battalion to call for general support in a turn. If the US FS-01 deploys as separate batteries with separate observers, you can allow them to operate as a battalion as well. 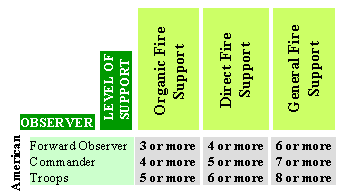 Remember that in the U.S. system, the FOs request the fire, but the Battalion FDC decides the fire missions. Compare this to other nations, where the FOs each control their own battery and combining their fire requires more negotiation (the British overcame this by doctrine, but other nations did not). The U.S. deployed 4 forward observers from each artillery battalion forward with the regiment it was supporting. General Support Battalions can thicken Direct Support Battalion missions. They should not fire shelling or random shelling missions. The battalion FDC contacted by the observer would not call for extra support unless a good target were available. They can fire independent missions only against SPOTTED targets. They can thicken DS missions against SPOTTED or SUSPECTED targets as per the normal rules. Batteries within independent GS battalions should not fire separately. Any eligible unit can call for a separate fire mission. However, you will find that it is best to use the forward observers if you have them because of their higher chance of success. If they become casualties or cannot see a critical target, you can use other spotters as per the call-for-fire table. In other nations losing the FO sometimes means loss of the support of their battery. This is not the case for the U.S.
Feel free to modify the support levels and the die rolls needed for success at a Fire Support Element level. For example, a US-FS-03a (Armored Artillery Battalion) would usually be in direct support of an armored combat command, taking the place of the FS-01, but might be available as an independent battalion in General Support. After the game was published, we found some mistakes in our U.S. artillery organizations. Please see the errata for the correct organizations. Almost all U.S. artillery was organized into Battalions. A battalion of artillery usually contained 12 guns organized into 3 batteries of 4 guns each. 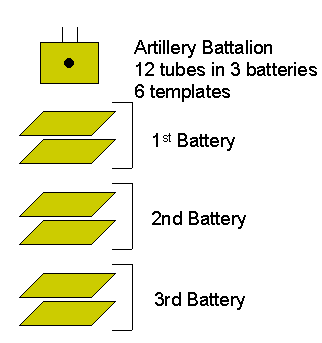 In Battlefront terms, two guns form a template, so each artillery battery is capable of placing two templates and the entire battalion is capable of placing 6 templates. This organization is reflected in FS-01, FS-03, and FS-04, modified by the errata. Note that the artillery in the 3 x Regimental Cannon Companies (FS-02) was sometimes combined into the divisional artillery, adding another 18 guns (9 templates) to the divisional artillery, or 3 templates to each battalion. This would make the FS-01 consist of 3x3 template batteries instead of 3x2 template batteries (our original FS-01 organization before the errata). However, the cannon companies were often used as infantry, especially when the infantry replacement needs became critical in late 1944, so the standard battalion organization of 3x2 template batteries should be used unless your research indicates otherwise. The most common U.S. artillery piece was of 105mm caliber, either a gun or howitzer. These were used in the "Medium" artillery battalions. 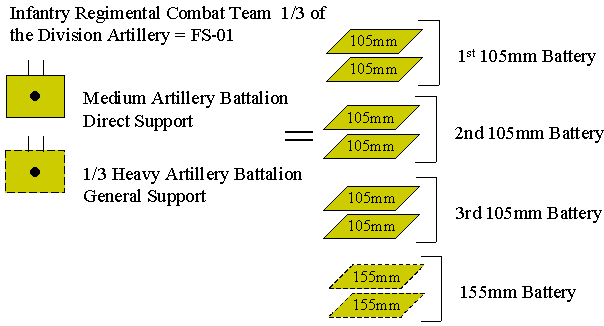 In BF, the basic 105mm template is large with an attack strength of -1 vs V and 0 vs T, G, sV. There were also heavy artillery battalions based on 155mm guns or howitzers (large template, +1 vs V, +2 vs T, G, sV). While there were some other organizations using even larger artillery (8", 240mm), these will rarely be seen in a Battlefront game as they were primarily used for counter-battery and interdiction missions deep behind the front lines. Smaller artillery pieces (75mm - small template, -1 vs V, 0 vs T, G, sV) were often used by airborne troops. The major exceptions to the 12 gun organization were the Self-propelled Artillery 105mm Battalions which contained 18 self-propelled 105mm howitzers (BF card US-06 Priest) organized into 3x6 vehicle batteries. 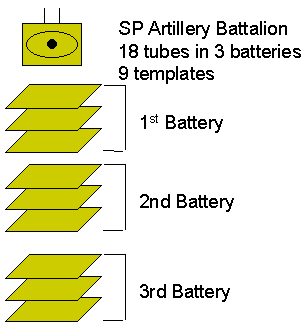 Each of these batteries is capable of placing 3 templates and the battalion as a whole is capable of placing 9 templates. This organization is found as FS-03a in the errata. The FS-03a is available as direct support for the armored combat command (BG-01). 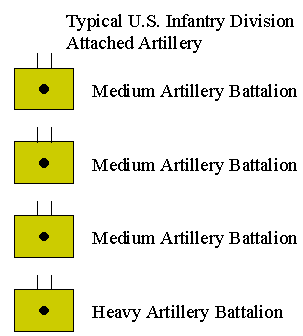 However, unlike the Infantry Divisions (see below), the Armored Division did not usually have a heavy SP Battalion permanently attached, but used 3 of the larger 105mm SP Battalions. Note also that the heavy (155mm) SP battalions only had 12 SP guns, not 18. The U.S. had LOTS of artillery battalions. Many of these were independent and were attached to organizations according to circumstances. However, each U.S. Infantry Division usually had several battalions of artillery attached to it on a semi-permanent basis. U.S. Infantry Divisions used an essentially "Triangular" organization. There were 3 Regimental Combat Teams (RCT) in a division. 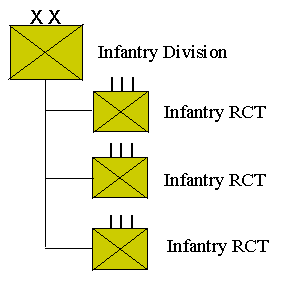 This 3-way organization was repeated at lower organization levels, the RCT further divided into 3 Infantry Battalions, each of which had 3 Infantry Companies. At each level of the organization, extra assets were available. The Artillery support for a division mirrored the triangular organization. Usually, there were 3 battalions of 105mm artillery (Medium) and 1 battalion of 155mm artillery (Heavy) assigned at the divisional level. Each Medium Battalion was usually assigned as Direct Support a Regimental Combat Team, with part of the Heavy Battalion available as General support. The divisional organization leads to the standard U.S. fire support element for a U.S. Regimental Combat team (BG-04, p.59). This element is called the FS-01 in the Battlefront:WW2 TO&E (p.61 and the errata). Each of the 3 regimental combat teams was given the support of approximately 1/3 of the divisional artillery. This means that a RCT would have 1 Medium (105mm) artillery battalion in direct support, and the general support of approximately one battery (1/3) of the 155mm divisional artillery. This organization is not rigid, although it should be used unless a high-value target is engaged. 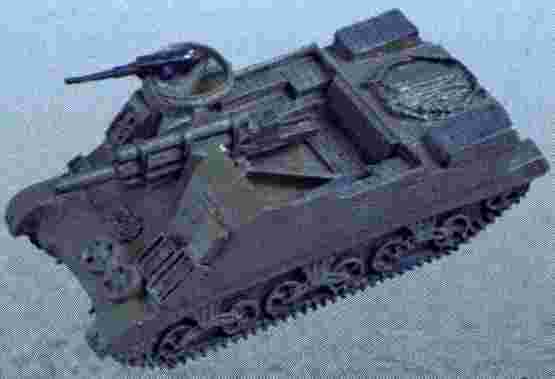 For example, the other two Medium battalions and the rest of the Heavy battalion could augment a mission. Also, support could be requested from other artillery organizations, such as independent battalions. 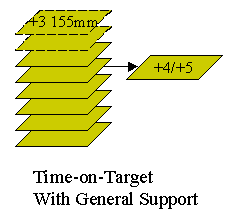 Any support outside the standard FS-01 should usually be considered General Support, unless the scenario specifies otherwise. 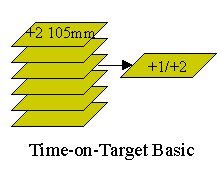 A time-on-target attack is a special type of attack that is available to only U.S. forces in Battlefront, although you might allow the British to use it in a pre-plotted fire plan. It essentially combines many batteries of artillery into an attack on a single template. The strongest artillery in the attack is used as a base and then the modifier is calculated based on the number of templates firing (as specified in the errata, you get a +1 modifier for every 3 templates firing rounded up). The smallest artillery element that can be added to a TOT attack is a battery. By itself, a US FS-01's time on target attack is not very impressive. 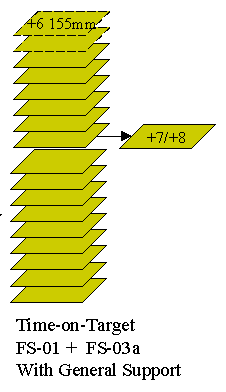 In fact, it is the same as a thickened concentration but only covers a single template. The modifier is a +2 (6 templates divided by 3 rounded up) added to the base attack strength of the 105mm artillery (-1 vs V, 0 vs T,G,sV). However, watch what happens when the general support arrives. Not only do you use the 155mm attack factors, but there are now 8 templates firing so the modifier is +3 (8/3 rounded up) added to the base attack strength of the 155mm artillery (+1 vs V, +2 vs T,G,sV). This will definitely get the attention of almost all targets and will be devastating against soft Targets. Time-on-target really gets interesting if there is more off-board artillery available. Here is an attack launched by a combined US FS-01 where the general support arrives (8 templates) and FS-03a (9 templates). The net modifier is a +6 (17/3 rounded up) added to the 155mm factors. This is a dangerous attack for even the heaviest armored vehicles. The key point in the U.S. system is that the Battalion Fire Direction Center allocated the actual fire missions, while observers requested fire. If necessary, the FDC would request extra support from other HQs if the target was attractive enough. This decision was not in the hands of the FO. Thus, even though the FS-01 is a typical "slice", an infantry regiment could often call for support from other battalions in and outside of the divisional organization. At Mortain, Lt. Weiss was primarily supported by the 230th Field Artillery Battalion, but some of his missions used the other two divisional 105mm battalions and he also received support from the divisional heavy artillery and other artillery when available. He did not always know what support would arrive. Instead, he described the target and asked for a fire mission. Also, after being in place for a little while, some of the targets around prominent geographic features were registered and could be hit accurately with minimal effort. He would say "Fire Concentration 359" and the coordinates and settings would be repeated. This led to both fast and accurate responses. Under the German system, an attack from an unexpected direction could expect to be free from artillery fire for about 10-12 minutes as the fire was adjusted onto the target. Using the American system, this time was sometimes reduced to under 3 minutes. The British were even faster but sacrificed some accuracy. The U.S. system was geared toward the rapid delivery of concentrated fire in an effort to Destroy the enemy rather than Neutralize him. While they knew how to do all of the complicated calculations for the more sophisticated fire plans, such as moving and lifting barrages that change direction, pregame fire plans for the U.S. should be slightly less sophisticated than those of the British. On defence where the U.S. forces have been in place for any length of time, be sure to give the U.S. player some preregistered concentration points and possibly allow him to establish new ones during the course of the game. The weaknesses in the U.S. system were more "psychological" than real. Unlike the British system, where artillery was never considered in reserve and was always available to support other formations, Divisional commanders in the U.S. Army occasionally regarded artillery supporting their formations as their own property. This occasionally hindered coordination of strikes involving several different divisions' assets. However, this problem was mitigated by the large number of independent formations that were available at Corps and Army level. It also would not surface until you get to a multi-divisional level battle and so will generally not effect battles at the level of a Battlefront game. As Mr. Doubler's quote at the beginning of the page suggests, the training of all U.S. troops to call artillery was a result of the experiences of the U.S. Army in Tunisia, where it found that it needed to update its inter-war doctrine. In Tunisia in 1942 and early 1943, the doctrine was much more dependent on the Forward Observer teams, with few others trained to call fire. While scrounging around a used bookstore, I was fortunate enough to discover a book from 1944 entitled "Forward Observer", which was the personal memoir of an FO who participated in the Tunisian battles, including Kasserine Pass and the final assault on Tunis in 1943. He describes in detail the artillery practices used to support the infantry (essentially FS-01 as described above), but also indicates that it was unusual for anybody except the trained FO teams to call artillery, although the artillery commanders could walk through front-line troops through the procedures in an emergency (the book describes an instance of this). To simulate this, for Tunisian battles, modify the U.S. call-for-fire tables to reduce the chance of troops contacting Direct and General support artillery. The book also describes how FO teams were used aggressively, often being positioned in front of the U.S. lines. In one case, his FO team infiltrated and called in fire on the Germans from behind the GERMAN front line. Although this resulted in their capture, they were able to operate long enough to completely disrupt the German position.